July 3, 2015 – NASA’s Curiosity Mars rover is examining a valley where at least two types of bedrock meet, for clues about changes in ancient environmental conditions recorded by the rock. 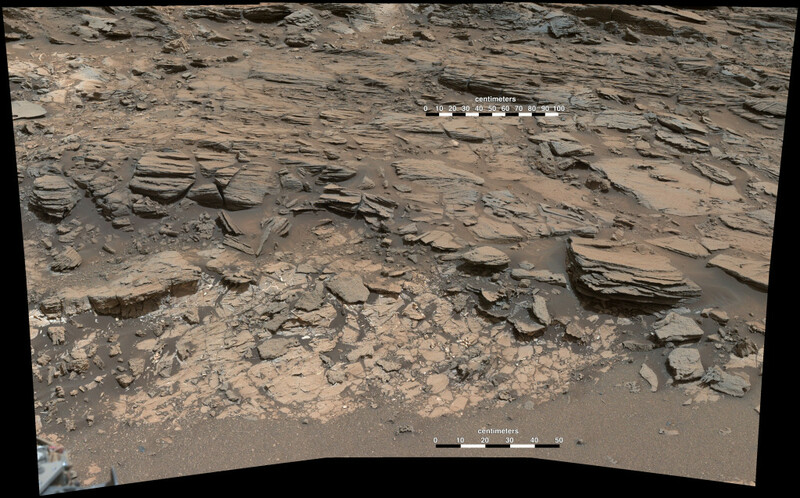 In addition to two rock types for which this site was chosen, the rover has found a sandstone with grains of differing shapes and color. Curiosity’s international team has resumed full operations of the car-size mobile laboratory after a period of limited activity during most of June. The operations moratorium for Curiosity and other spacecraft at Mars happens about every 26 months, when Mars passes nearly behind the sun from Earth’s perspective, and the sun interferes with radio communication between the two planets. At the rover’s current location near “Marias Pass” on Mount Sharp, Curiosity has found a zone where different types of bedrock neighbor each other. One is pale mudstone, like bedrock the mission examined previously at “Pahrump Hills.” Another is darker, finely bedded sandstone above the Pahrump-like mudstone. The rover team calls this sandstone the Stimson unit. Curiosity climbed an incline of up to 21 degrees in late May to reach Marias Pass, guided by images from NASA’s Mars Reconnaissance Orbiter showing Pahrump-like and Stimson outcrops close together.